On this most special day when we celebrate Moms and the unique contributions they make to our lives and society as a whole, I want to highlight two special folks: my own Mom and my Wife. 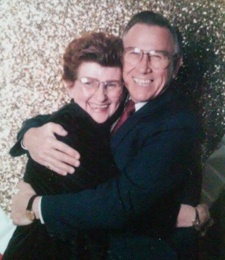 My Mom died at the end of January 2006 from complications from her emphysema. So, I am missing her today. She was a great inspiration to me, always supportive. I wished she had pushed me more throughout my life, but Moms express their love in different ways and she wouldn’t have been my Mom if she didn’t express her love for me in her own special way: making Christmas and other holidays fun, encouraging me to express myself with my art, giving me hugs and kisses, holding me accountable for things I did wrong. Thanks, Mom, for the many ways you loved me! How could I not end this post with a brief tribute to the most special woman I know: my wife, Stephanie. We have been married since December 31, 1999, but we have known each other since 1995. Yet, it feels like a lifetime and I do not mean that, as some do, in a pejorative sense. She completes me and makes my life work in ways I never knew God had planned for me. Yes, now that I have gotten older and we have shared these many years together, I question the reasoning behind my rejection of the ‘one-special-person’ statement because my wife fits my life and feels so unique to me that life without her brings tears to my eyes. My wife makes life in our home a delight not only for me, but for our two children. For all the blessings that my own mother was to me, the experience of love my own children experience from this woman I love and hold in highest esteem is unquestionable. It is deep and abiding. Shared in many splendid ways: forgiveness and grace, hugs and kisses, notes of encouragement, devotion to making holidays and birthdays memorable, lessons to nurture their young minds (we homeschool), and on and on. They will one day, understand the depth of the love this Mom of theirs has for them. They do now, of course, but in a way that lacks the maturity of experience from years gone by. I see glimpses of it now, but I long for the fullness of that realization when they come to understand that her love and sacrifice was not merely earthly and temporal, but ultimately a gentle expression of God’s own love for them. So, today, I celebrate most of all, the Mother of my own children.